We've been thinking about toys with the holidays coming up. Wood is our toy material of choice because it's beautiful and durable, so we compiled a few of our favorite wooden toys. Grimm's toys are always a hit, and Fawn Shoppe has a lovely collection. The pull along rabbit, mini maracas, and wooden sail boat are so nice we wouldn't mind finding them in our own stockings. Little Sapling Toys, found on Etsy, also has a number of well-made wooden toys, including these wood lacing boards. We also have one of their trucks, which is beautifully made. This wooden tea set made by Plan Toys is another favorite around here. Poketo also sells these adorable wood animal plates. 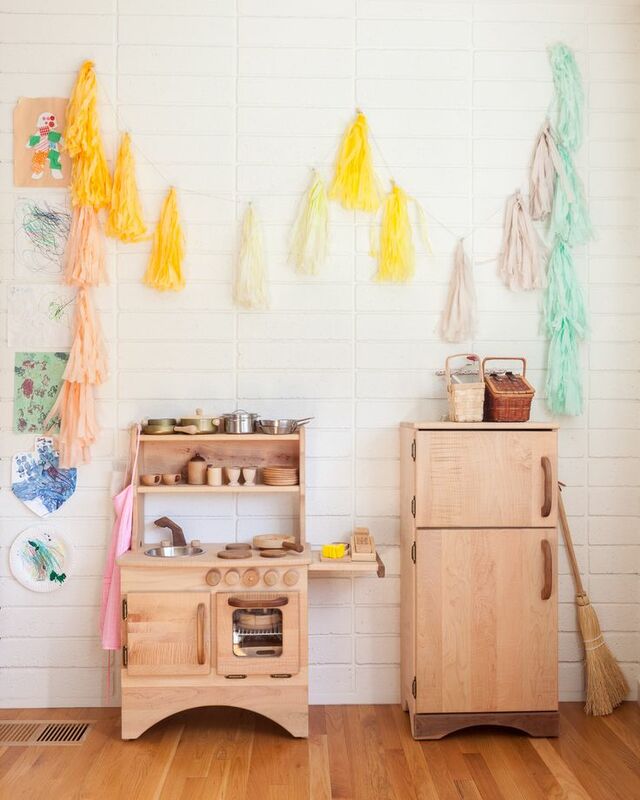 Speaking of kitchen wares, we are in love with this wooden play kitchen, built by Camden Rose, and of course you'll need food to go with it. Melissa & Doug makes a variety of wooden toy foods that you can actually cut! If you want to go big, check out these wonderful wooden balance bikes. Early Rider & Heritage make stunning wood bikes that are built to last.